Putting a lock on the door was all you needed at one time to protect your business and data. Today it is a completely different story now as we go digital with every aspect of business. These threats can come from unknown perpetrators outside the office or from disgruntled employees at their desk. Although not every threat can be anticipated or prevented, especially with technology changing daily. But by implementing today’s best practices can make it harder to damage your digital reputation and property or steal you data, just like the lock on the door of days gone by. Are the latest security updates applied to your computers? Is Anti-Virus software installed, configured correctly and running on all your computers? Do you ever change your passwords, even after employees quit or are terminated? Are all unnecessary ports disabled or blocked on your router and computers? 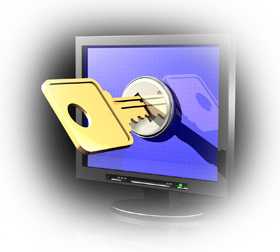 Is sensitive data password protected or encrypted? Global Communications can assess your business systems vulnerability and deliver an action plan to resolve gaps in your digital security to mitigate potential risks that can affect your business.